Posted on January 23, 2019 at 1:32 pm. A new undergraduate minor in dark sky studies at the University of Utah is the latest step in the movement toward reducing light pollution. Already a leader, Utah has added to its acclaim as the center of the dark sky universe with a new interdisciplinary undergraduate minor in dark sky studies at the University of Utah, which the university’s Consortium for Dark Sky Studies developed. Open to students university-wide, it includes 15 instructors from across campus and approaches the subject from many angles, including engineering, urban planning, public health, history, philosophy, and more. The Consortium for Dark Sky Studies is the first research center in the world to focus on the connections between artificial light and dark skies. Watch the video to learn more about what they do. Students will get the opportunity to find creative solutions to the problem of disappearing darkness: light pollution continues to affect the night sky to the point that 80% of the world can no longer see the Milky Way. Ongoing research studies connect the increase in artificial light to altered behavior in animals, health issues in humans, and more. This year, a Swiss environmental organization, Pro Natura, even named the glow-worm as its Animal of the Year to highlight the rapid decline of insect life around the world due to threats including habitat destruction, pesticides, and light pollution. Students in this program will conduct research of their own: the curriculum includes developing drone technology for measuring, collecting, and analyzing light levels and temperatures, among other data. They will then use the data to identify problem areas and come up with creative solutions—and dark-sky friendly lighting is certainly going to be on that list. Helping our skies stay dark at night does not mean our cities have to go dark: according to the International Dark-Sky Association (IDA), dark-sky friendly lighting is simply lighting that is properly designed and used wisely to minimize light pollution. It still can help make drivers and pedestrians feel safer, and it can also help cities save money. Increase the perception of safety with lights that are focused on the street, sidewalk, or pathway where they’re needed. Smart lighting focuses the light down, using shielded fixtures that don’t cast light into the sky—or into your eyes. Save money by choosing lights that use controlled dimming to reduce energy usage. Controlled dimming means that the lights dim at a set time—usually in the middle of the night—to reduce energy consumption when traffic is at its lowest. Going a step further to choose solar-powered dark-sky friendly lighting only enhances those benefits. Solar lights can be placed anywhere light is needed—even far away from grid connections. Decision-makers can ensure solar lighting is added conscientiously to ensure it meets IDA’s recommendations. Sol’s solar-powered, dark-sky friendly lighting is available with shielded fixtures to help focus the light on the ground. They also help reduce energy wastage by ensuring all the light produced is usable light—and saving energy will help your battery last longer. Our solar lighting layout calculations ensure proper light coverage, improving visibility and light quality for all street or pathway users. You will also save money during the installation phase: solar-powered lighting doesn’t need trenching to connect each pole to a power source. This saves money on maintenance while eliminating energy costs to power the systems. And that’s better for the environment, too. 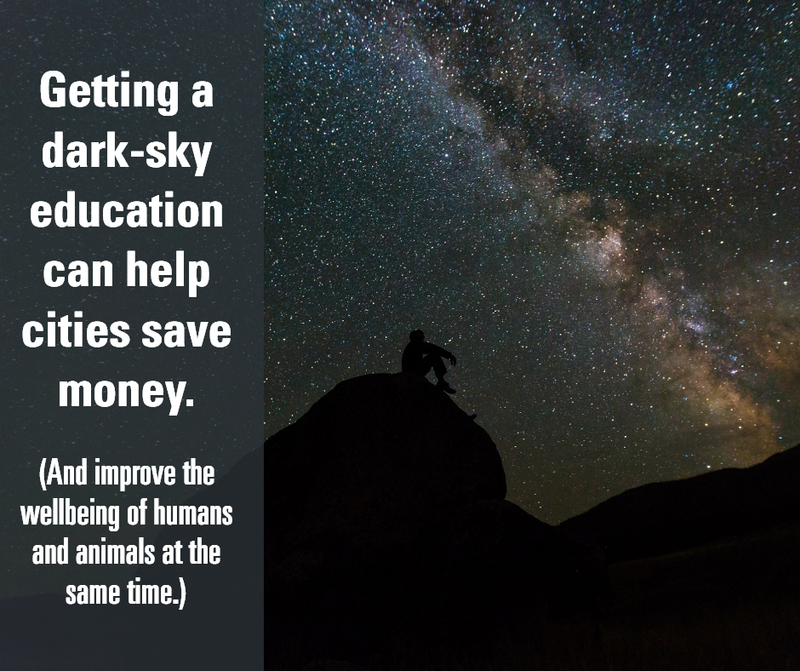 We need more advocates for preserving the night sky, and the University of Utah’s new program is a step in the right direction. With education and effective tools, we can help keep light pollution from getting worse, while still increasing the perception of safety and improving visibility for every road user. >> Learn more about our dark-sky controls and how they meet the IDA’s recommendations.